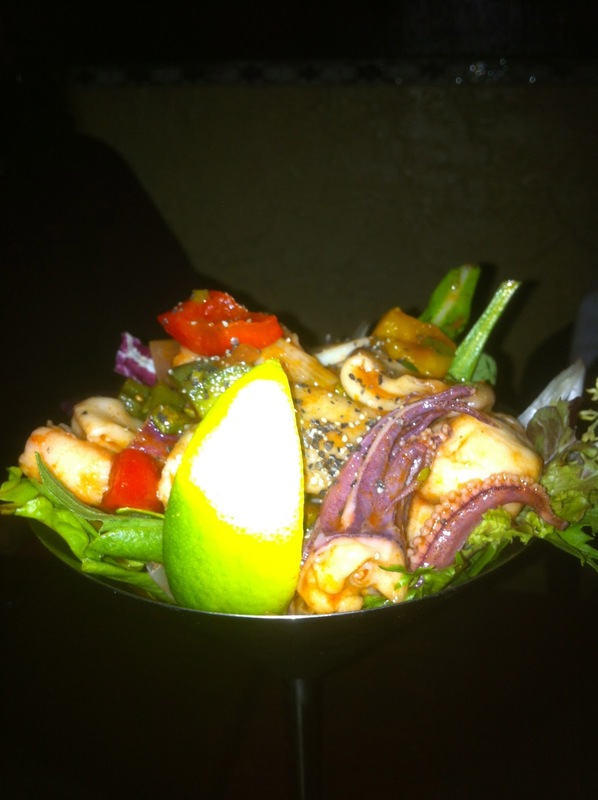 The Sherlock Holmes Reviews: Ceviche Tapas - Many, Many visits will be needed! There exists a restaurant from the Clearwater, FL region that has so delighted many that for Watson and I it has become the de facto "Pre-Ruth Eckerd Hall Concert" venue....a delicately perfect mix of just-right portions and eclectic libations, imbued ambiance and perceived resident hipness. You leave feeling worldly, satiated, and still light in step! And SO well accepted has this concept amalgam become that an expansion was then successfully executed into the Downtowns' of St. Petersburg, Sarasota, and Orlando...and all to well deserved and continued popular acclaim. Thusly, when during a recent South Florida sojourn, recent arrangements were made in Delray Beach to clandestinely dine with esteemed associates at a 'NEW' restaurant called 'Ceviche Tapas Bar and Restaurant', my sensitive gastronomic antenna went up and into high alert. Dining on Atlantic Ave. in and near the Downtown Delray Beach area has become part of my investigative 'beat' so to speak, a confluence of locales and grottos as varied as there are countries under her Majesty's domain. And fortunate do I feel for my high frequency visits have allowed me to investigate all types of simply wonderful creations in and around this multifarious beach town. Upon arrival at Ceviche, my early appearance needed to assure my finer sensitivities and be sure of it's pedigree before our guests arrived, I was pleasantly surprised to see the familiar red and black 'Ceviche' logo and I knew that another question had been answered....that being 'Will our guests be treated well and enjoy themselves with this evenings fare?' This would certainly be proven tonite! My Investigative Associates this evening included the Earl of Schindelholz, a frequent participant in many cases when Watson is not in attendance, and Lord Frederick of Cucamunga, he also a previous and increasingly frequent guest in many recent cases. With several well chilled Cervezas from the puckishly young yet well prepared bartender for the Earl and I along with a double Don Julio Margarita for Lord Frederick (he of large and domineering stature yet with the manner of a revered and fiercely loyal Buckingham Palace Sentinel) we soon welcomed our evenings other esteemed guests: Lady Marlene and Contessa Koutsis, delightful dining companions whose royalty and lineage has brought us into closer working relations over the past many months and will likely do so again in the next many as well. As a true Tapas style restaurant we experimented with all manner of offering in the attempt to assay with all and be tied to none, partaking in the domain's namesake 'Ceviche' offerings choosing the 'Ceviche de la Casa', the 'Ceviche de Atun', and the 'Ceviche de Gambas', three of the seven introductory Signature Ceviche dishes. The Ceviche de la Casa with it's Black Grouper, Squid, and Market Fish marinated in a lemon and lime juices and blended with onions, peppers, tomato's and cilantro was easily the winning choice of the three....offering such an amalgam of tastes that I truly believed I had ascended into the realm of Marquis Salvador Domingo Felipe Jacinto Dali i Domencho.....aka Salvador Dali - this was surrealism at it's best! And such Surrealism in dining, especially in the Tapas-sized portions of Ceviche-stuffed Martini Glasses allowed us, is as delicious a morsel of happiness as any that one is likely to have. The marinating fish in lime and lemon juices with onions and such....inspiringly allows the various textures to meld with it's spices and sweetness to create a wonderful melange of joy to the palate... truly surreal......or perhaps that is part of my addiction? Content but left wanting for more of our ceviche introduction, our next delivery included delights from the Tapas Frias section (of 17 offerings) including 'Tabla Mixta, a variety of sliced meats and Blood Sausage, and the Tapas Calientes apportion (of some 45 listed.... including 15 Vegetales) with Vieras Puerros, or Sea Scallops with Leeks and Machengo Cheese in a Sherry cream sauce. The only adjustment that Delray diners might need to make at Ceviche is that the true 'sharing' nature of the Tapas experience sometimes leads to all manner of food eaten in ways and at paces unexpected and the plates disappear much more quickly than expected so ordering MORE than you think you will want becomes the preferred modus! And STILL we extended ourselves further with one of the 5 Paella's offered, selecting the Paella Valenciana, made up of so much seafood and saffron rice that it sumptuously led us into the Posters where with the Tres Leches, Torte Valenciana, and a decadent Cafe Ceviche of Gran Torres Orange Brandy and Licor 43 that quickly put away any desires I had of Ireland and Whiskey!